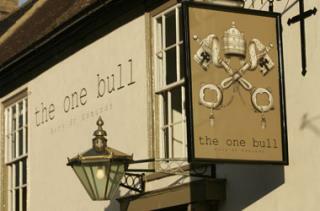 With only 66 sleeps until Santa appears, we only have limited spaces left at The One Bull for Christmas party bookings. However, we're pleased to announce that we are going On the buses again! Start your evening at The One Bull or The Beerhouse and we'll bus you over to The Crown or The Cadogan for your three-course meal and back again. It costs £28.00 per person for groups of 12 - 70. To view the menu at The Crown in Hartest, click here. To view the menu at the Cadogan at Ingam, click here. Make sure you mention this when making your booking.